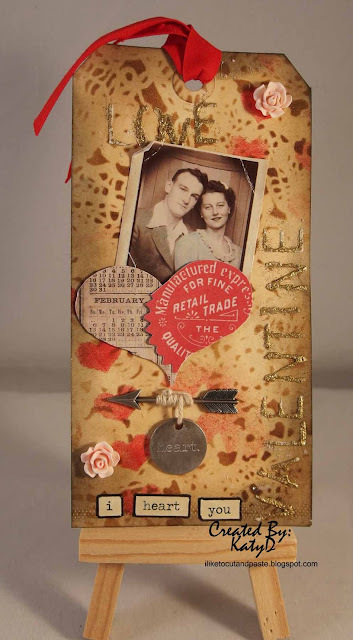 I am so excited that I finished my Tim Holtz tag for February! It's always a treat to be able to make what Tim makes (or come really close to making it). I used a different stencil-mine was doilley but I like the one he used better (I have to add it to my list). I used a couple of his roses and painted them with spun sugar distress paint. I love these little roses! I love the heart too. It is 2 pieces of ephemera glued to a heart base. For me I hadn't thought of using the printed pieces like this so this makes me really happy. I used his same technique on the raised words except that I had to spell out the words using a stencil because I didn't have the one Tim used. Tim's tag and link up (because there is still time) is here. Loveeeeee this! LOVING that heart!!!!!!!!!!!!!!!!! Katy, this is beautiful!!! LOVE the picture!!! hello Katy! so awesome, luv the layers and the vintage look! so glad you played along with us at simon says stamp wednesday challenge!